The Nokia Lumia 800 is the first Windows Phone that I have reviewed. So that puts me in a perfect position to offer my perspective as a brand new user. The Lumia 800 is curvy at the left-right sides and edgy at the top-bottom. Its smooth matt surface provides little grip on your hands, and is easily stained with grease. I like the subtle curves of the touchscreen surface to blend with the phone curves. There are 3 hardware buttons: the volume rocker, the power button and the shutter release. I find the power button too close to the volume buttons. When I hold the phone in a natural position, my index finger rests on the volume button, so I tend to press the wrong button to turn on the screen. On the top of the phone are 2 instructional (removable) labels to teach the user how to get access to the micro USB port and to remove the micro SIM card. At the bottom, you will find speaker grilles. On the whole, the design is very clean, seamless, modern. Having tried both Android and iOS interfaces extensively, I can’t help but make comparison to the Windows Phone 7. iOS and Android interfaces are all about presenting their apps in rows of icons, which looks pretty much like a computer desktop we are familiar with. You can expand as many screen pages as you want. These 2 screens are all you need to find all you have on a Windows Phone. On the other hand, Windows Phone is very different. It only has 2 main screens. The first screen contains all the live tiles, and the second screen all the apps. You can access everything in your phone with these 2 screens. Depending on how the apps are designed, the tiles will animate to show updates. With such large tiles, it is easy for you to look out for notifications like unread message count, appointment schedule, your contacts’ latest social statuses. Fonts and the transparency level plays a major part in the interface. It tells you what the text implies, and so the screen displays a lot more information without confusing users. Just look at the settings screen above. It shows your “System” settings menu with all the categories and their setting values. To see more system settings, scroll down. If you swipe the screen to the right, you will be expected to see “Applications” settings menu. Lumia 800 comes pre-installed with Nokia Drive, a turn-by-turn navigation app to aid you in getting around. 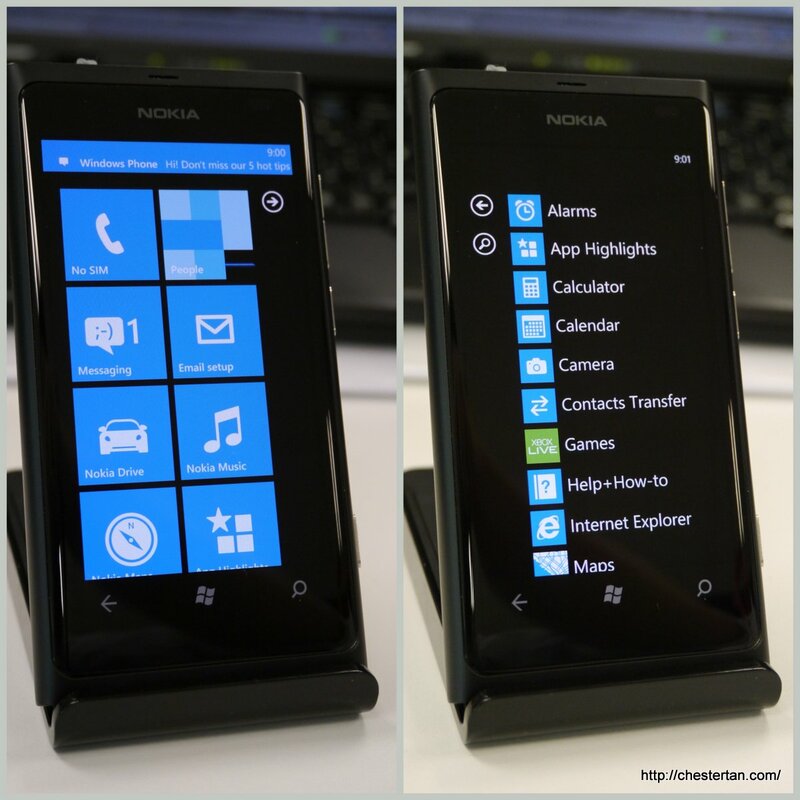 It also comes with Nokia Maps, making the Lumia one of the few smartphones that do not need to rely on Google Maps. The number of apps in the market are nowhere compared to iTunes and Android Markets. There aren’t a lot of free apps, but all paid apps are available for trial downloads. Due to the OS limitations, third party social apps like Twitter and Facebook do not support background updates. Whatsapp supports notification, but your conversation history is lost if you uninstall the app. The official Foursquare app does not come with check-in Live Tile, but you can download 4th & Mayor app which offers better experience. Familiar apps like Foursquare are redesigned for the Windows Phone. There are a handful of gaming titles driven by Xbox Live. Just like Apple Game Center, you can create an online identity and share your game achievements and conduct multi-player gaming challenges. But Xbox Live is cross-platform which brings your gaming experience from your mobile to your PC and your Xbox console – potentially. The dedicated shutter release button offers the user ease of activating the camera function, anytime. You can choose to capture the photo instantly without focusing, or you can half-press the shutter button or tap the screen to enable focus before capturing. You can conveniently upload to your predefined social app like Facebook. The image quality isn’t on par with iPhone or Samsung Galaxy S2, but it’s good enough when shooting under non-demanding lighting conditions. Large camera shutter release button, very useful for quick shots. Would the Nokia Lumia 800 running on Windows Phone 7.5 suit you? That would depend on what phone you currently own and your usage behaviour. Let me break down the analysis. The Nokia Lumia 800 is a good device to start your smartphone experience. You get a balance of functionality, interface consistency, and interactive information. It doesn’t offer much advanced features or lots of third party apps, but you probably will not need them as a new smartphone user. And as you grow to become more savvy, so would Microsoft be improving the OS functionality. I firmly believe that over time the Windows Phone will match the other phone OSes. The iPhone experience is app driven, so when you switch to a WP7 phone like Nokia Lumia 800, you will get a withdrawal syndrome because there aren’t many entertaining apps or games to fill your void. – you like a device that offers you an interactive glimpse of what’s happening, like your contacts’ latest social status and photo updates, your new messages from SMS or email or instant messenging, your calendar appointments. On the iPhone, you need to go into every app to find out. On WP7, you see the updates on the single home screen. Interactive and informative Live Tiles. WP7 is many steps backward for an advanced smartphone experience. You lose a lot of functionality that you might be so familiar and be dependent on. I find myself struggling with the lack of third party apps, most of them lacks background tasking support. And the ability to share files across apps easily. Or customise the home screen with widgets of various sizes. But if you are not an app person and are already happy with all the built-in apps, then WP7 works well and works pretty too. – you find Android phones too complicated to use due to the customisability resulting in inconsistency. Asking for help with fellow Android users turn out futile because they would ask you to use so-and-so app to solve your difficulty, but that again adds further confusion. I am impressed with the design of the phone and the interface, agreeing with most other expert views in the industry that Nokia and Microsoft have delivered an evolutionary communication device. But as an advanced tech-user, I find Android OS a more empowering platform that better meets my needs. There is great potential in Windows Phone, and I can’t wait for Microsoft to catch up with Android and iOS. My wish: more free apps, improved background tasking, file management. Have you tried the Lumia 800? Do you like the Windows Phone interface?